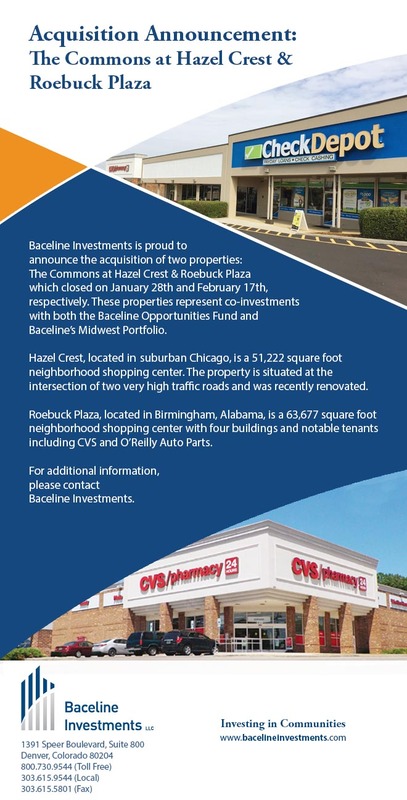 Baceline Investments is proud to announce the acquisition of two properties: The Commons at Hazel Crest & Roebuck Plazawhich closed on January 28th and February 17th, respectively. These properties represent co-investments with both the Baceline Opportunities Fund and Baceline’s Midwest Portfolio. Hazel Crest, located in suburban Chicago, is a 51,222 square foot neighborhood shopping center. The property is situated at the intersection of two very high traffic roads and was recently renovated. Roebuck Plaza, located in Birmingham, Alabama, is a 63,677 square foot neighborhood shopping center with four buildings and notable tenants including CVS and O’Reilly Auto Parts.